I wanted to share a small bit of happiness with you that made my day. I learned a super helpful tip from my mom. If you love coconut juice you will love this method, it requires very little effort. Bonus tip at the end. A little violent but very easy to open the coconut to access the coconut meat. Hope you will find the tips useful. Phase 1: Starts out with an innocent tickle at the throat, a few soft sneezes, and a slight chill down the spin. My internal alarm and stress level goes into full panic mode, “stop cold at all cost!” In no time, the whole shebang knocks me to the ground. Phase 2: Throat feels like the desert with red rivers in between. Nasal passages, what passage? Clear, yellow, green, red, thick to thin snot. You name it, I’ve got it. Phase 5: After much suffering I get better but the coughing never fails to persist another 3-4 weeks or more. Longest holding record for being sick: One month, literally in bed, with a cold turned pneumonia. It started on my birthday…I hate being sick with a vengeance! I’ve had 2 pneumonia in my lifetime and many, many colds and flus in between. I’ve taken lots of antibiotics which basically fried my whole immune system. Skin allergies and all sorts of sensitivities started developing over the years. Last time I took Ibuprofen for hives, my whole face got swollen, so I really liked the following advice given by my nurse which were simple and non-medicine related. At the first sign of a cold start on this routine right away. Don’t wait until other symptoms develop. If you wait things will only get worse before it gets better. You can still use these advice if you are already sick. It will help reduce the symptoms and help speed the healing process. In addition to gargling I use a sinus rinse in the morning. I rinse with a warm saline solution to the reduce chances of a sinus infection. It also really helps me remove most of the nasty nose clogs. You can find Simply Saline in regular drug stores in the allergies section. I purchased my kit many years ago at a local CVS. I originally bought it for my mom’s allergies as an alternative to medications. You can read my detailed review here. This rinse has a learning curve. For me it was worth the effort to master it. The key purpose of this routine for me is preventing the cold or flu symptoms from getting worse. By keeping the airway passages (nasal and throat) sterile and clean, you will kill off the bacteria and breathe easier. Sipping lots of warm liquids and using the humidifier will keep the throat moist which will decrease the chances of having further irritations to the throat that will cause coughing. During my one month in bed with pneumonia, I was skeptical of the significance of these advice but I was willing to try anything to get better. To my surprise I got better. The irritation in my throat and nose got better and my cough eased. I am so glad I followed her advice and am thankful each time I get sick I now know what to do to cut the life span of my cold or flu in half. Nowadays, along with lots of rest, I probably only get less than half-way into Phase 1 on most of my colds. Take vitamin c. I like to take 1-2 packs of emergen-C a day when I am feeling a little off. I like the Acai Berry Flavor. You can get them at Costco or any health food store. Flavors may vary in availability at different stores. During the flu season, wash your hands often with soap and warm water. When you feel sick maximize your sleep. Keep your feet, neck, head, and torso warm. Intake tons of warm water, by sipping. Drinking water this way helps your body absorbed it instead of flushing it out quickly. Absorption gives the water a chance to go through your system and detoxify it. I got the chills all day yesterday and was fearful of getting sick again. After a day of shivering I finally recalled a recipe my mom’s friend taught me. A few years ago my mom suddenly fell ill and I was panicking since she never got sick. 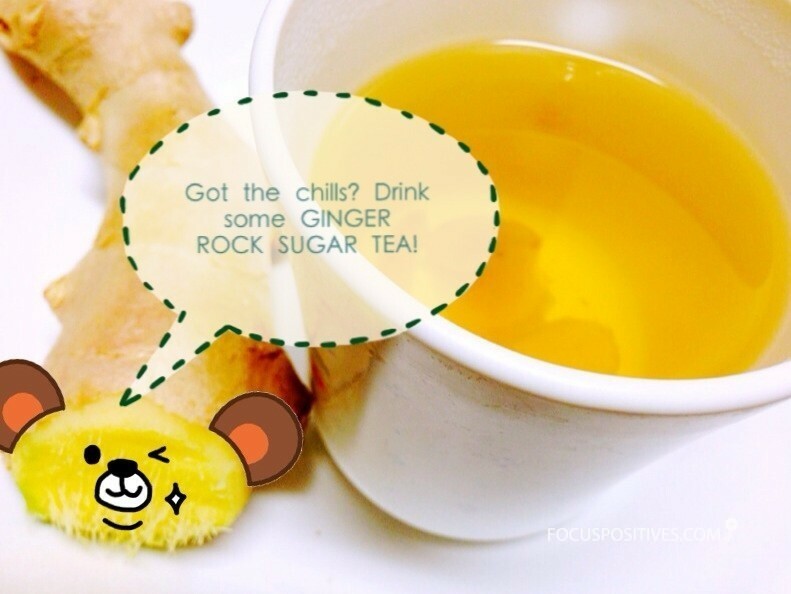 I made her this ginger rock sugar tea and it worked very well on her. I have since used it on myself every time I felt the first sign of the chills. I wanted to share this with everyone and keep this in my notes so I won’t forget again. This tea is tasty and warms you up quickly. I sip the tea in bed and sleep the bug off after I finish the tea. Peel and slice ginger. You can add more if you can handle the heat. Heat a clean pot with medium heat for a few minutes. Stir or flip the ginger slices over continuously, like flipping pancakes. You want to dry it out. The key is to make sure the ginger does not burn. If it burns you may have a sore throat after you drink it. It takes a few minutes, if you notice the ginger burning lower the heat and lift the pot from the stove to cool it off. Once the ginger is dry, pour 1.5 cups of water into the pot. Raise the heat and bring the mixture to a boil. Lower the heat to a slow simmer and simmer for 15mins. Add small pieces of rock sugar. Add according to your own taste. Once the rock sugar has melted pour in to cup and sip while it’s still hot.